« Glasgow, Housing and Red Road – Another Scheming Failure? I took my Mum on a drive the other day to the old streets where our extended family used to live. Mary is 87. The shock of seeing that Hamiltonhill had vanished, its once busy streets now vast expanses of green grass and emptiness took a wee while to sink in. ‘It’s really sad’ Mary said. That wasn’t the half of it yet it conveyed all of what we were both feeling as we sat in disbelief. I took photos to prove to myself and other family members that it really was true, that there was nothing left. 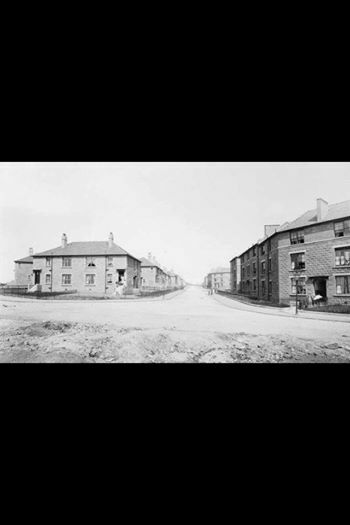 Mary had moved into her Granda and Granny’s house in 112 Ellesmere Street in Hamiltonhill in the north of Glasgow when she was 14. She could no longer stand living in Bridgeton with her mother Annie and her stepfather – that’s another story. Grandpa Johnny had moved there in the 1920s from the Anderson area with his wife and their unofficially adopted daughter Agnes. Agnes wasn’t her real name, but why it was changed will forever remain a family mystery. The two room, kitchen and bathroom flat was also, at times, a regular temporary home for Annie, Mary’s wee sister and baby brother when they needed refuge from the house in Bridgeton – at times seven people in two rooms. By the 1950s Agnes was the only one left and she married the boy next door – well, down the stairs actually. James lived in a similar two room, kitchen and bathroom flat with his parents and five siblings. As Mary recalled, ‘ the two rooms were just a’ beds.’ Agnes outlived her husband and remained in the same flat at 112 Ellesmere Street until her death in 2008 aged 89 years. 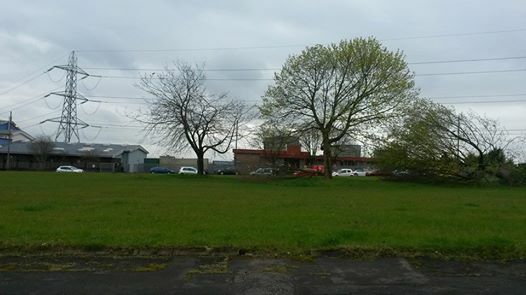 Hamiltonhill is linked to Possilpark by Auckland Street. The smarter four-in-a-block houses with gardens on the long street remain but the ‘slum clearance’ houses at the Possilpark end are now also gone. Rehoused in 228 Auckland Street from an overcrowded room and kitchen in the Calton in the 1930s Ned, my Dad, moved to the three room, kitchen and bathroom flat with his parents Cash and Alec, his sister Annie and brother Willie. Cash had emigrated to the east end of Glasgow with her widowed mother Annie MacAteer and brothers from Belfast in the 1920s. Alec came from Edinburgh at about the same time. Cash and Alec refused to let their children be evacuated during the war, ‘if we’re gonni die, we can a’ die thegither…’ they remember her saying. Annie married Jim from across the road in Burmola Street, Willie courted Bessie from downstairs but her family put a stop to it because she was a Protestant and he was not….. Ned was one of the first generation of Catholic boys to get an apprenticeship and became a bricklayer. Willie being older had not had that chance. Willie never did marry. So Mary, aged 14 from Ellesmere Street, met Annie aged 16 from Auckland Street whilst electro-plating metal components during the war in a miserable factory in Port Dundas at the end of a long dark daily walk from Saracen Street along Craighall Road. Mary met Annie’s wee brother Ned and they later married and rented a room in one of the four-in-a-block houses in Auckland Street. The landlady was mean and the room unheated so they moved in with Ned’s parents until they found a better place to live. Alec’s nephew from Edinburgh, just out of his national service, turned up alone looking for a bed until he could find somewhere to live with his new wife who was living with her parents. Cash said to bring her to 228, she wouldn’t hear of them being separated and them just married. They lodged there until they found somewhere to live. These are brief snapshots from the lives of one family of migrants in those now vanished schemes. There is nothing there now but ghostly grid-lines bordering where once rich lives were lived in small, poor houses. The emptiness cried out from the quiet of memory, seeking shape and sound for those stories, their gift to the present.